• How might we forecast the future of sardine populations? Fig. 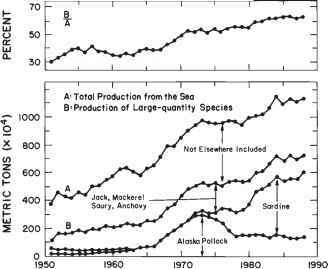 14.21 Total production from the sea, A, and production of large-quantity species, B, (bottom); and B as a percentage of A (top) by Japanese fisheries, 1951-88. 7 million mt in about 10 years, down from 11.3 million mt in 1988. This would be similar to the years from 1936 to 1945, when the total catch decreased from 4.2 to 1.8 million mt. To protect the fisheries and society from dislocations caused by a sudden decline in sardine landings and in order to try to mitigate its impacts, it is very important to know the future of the sardine stock as far ahead as possible. To this end, it is essential to raise the level of fisheries science and to continue to collect key data about fisheries and the global environment. • How can we absorb the shock of sudden drops in sardine landings? If the landings of sardine drop considerably in Japan, needless to say, Japanese society as well as its fisheries will be seriously adversely affected. In major sardine landing ports, such as Kushiro, Hachinohe, Ishinomaki, Choshi, and Sakai, many plants and facilities dependent on sardine landings would face economic hardships. Fish culture, especially of hamachi, would lose its supply of low-cost feed; clearly local, regional and national economic problems would ensue. Measures to cope with problems such as these must be sought in the event that the sardine population collapses once again. As shown in Fig. 14.10, an abrupt decline in sardine catch began in the 1940s, after its peak at 1936 and 1937, but the degree of decrease in catch varied from region to region. The rate of decrease was higher in more peripheral regions of the range of sardine, which was centered on the area west of Kyushu where the sardine seemed to spawn and develop (Table 14.3). The big drop in sardine migration in the waters around northern Japan and the increase in the East China Sea caused a great change in the regional distribution of purse seine fisheries, the major target of which was the sardine. Source: Institute for Fisheries Research, 1953a as 1947 the number of purse seiners exceeded what it had been in 1939, reaching about twice that number by 1950. The number of purse seiners larger than 20 mt in 1950 had increased to four times as many as that in 1939, indicating that the average size of boats got larger (Table 14.4). Although the total number of purse seiners throughout Japan almost doubled between 1939 and 1949, when we look at the regional breakdowns, their numbers in statistical sub-areas (around Hokkaido, Japan Sea North and West) decreased, those in Pacific North remained nearly unchanged, but those in Pacific South and East China Sea increased markedly, strongly affected by the change in geographical distribution of the sardine (Table 14.5). Another important issue relates to the reorganization of purse seine fisheries after World War II. Huge enterprises that had prevailed under national protection in the overseas and colonial fishing grounds in pre-war times, and had seldom competed with domestic intermediate and small fishery enterprises, came into direct conflict with these enterprises in coastal fishing grounds after World War II (as a result of restriction of their operating areas). In those days, each purse seiner was permitted to operate only within a small local area in accordance with fisheries regulations. Top-ranking ones among the intermediate and small enterprises as well as the huge enterprises demanded revisions of the fisheries regulations then in effect, so as to allow a purse seiner to fish unrestricted throughout the coastal areas around Japan. This demand was in conflict with the desires of the traditional, native intermediate or small enterprises, which tried to continue their fishing activities by rejecting newcomers, since their economic power was too small to compete with the huge enterprises of markets. • permit the building of new boats if smaller enterprises are managed jointly. 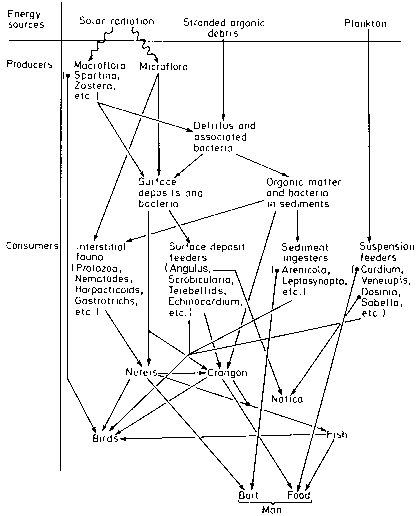 As shown in Fig. 14.22, more purse seiners were built in the statistical subarea Pacific North after World War II, with a peak in 1947. As the sardine stock declined there (Table 14.3), however, new shipbuilding declined rapidly. Measures to establish a financing system to assist the purse seine fishery in this area were discussed in the Japanese Diet at the end of 1948. The Fisheries Bill System for the purse seine fishery was established in January 1949. This led to the nationwide Fisheries Bill System six months later. 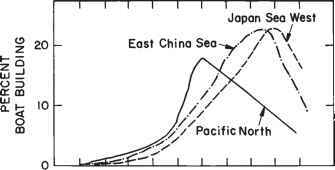 The subareas of Japan Sea West and the East China Sea had their peaks of shipbuilding later in 1950, indicating that investment had continued until then (Fig. 14.22).